Awaiting a very exciting release, I thought it was time to review the first book in the Titan-Series. Many may know the main male character from the Covenant Series! Yes, our Seth is getting his own story, how excited I am! The Return by Jennifer L. Armentrout, surprised me in many ways I thought it wouldn't. I'd like to point out that I read this book before I read the Covenant series. And to be really fair, that wasn't an all too good idea... I didn't know this was a sequel to the Covenant Series so I had in the beginning of the book a lot of confusion. As much confusion as Josie had because it was all new for her too. But it also gave me another point of view of Seth and I never understood why everyone hated him. So, a little piece of advice? Read the Covenant Series first! Speaking of hating Seth, this book never made me hate him. I only thought he was impossible at times and yeah, he got under my skin and irritated me. Yet we get to see another side of Seth too, one that we didn't got to see in the Covenant series and I really enjoyed that. It's also a time jump after the Covenant disaster which made sure we could see how Seth is coping with everything that has happened the past year. I thought that was really refreshing because he's so different than in the other series. In The Return, Seth has a difficult time. He's not his arrogant self, sure he makes comments but there's more to it than he's showing. The whole story really focuses on that, his feelings. I was very keen on being in his head because who wouldn't be? It's Seth we're talking about. The guy with the too beautiful eyes! Being in his head in this story is absolutely great because you discover so much about him that you didn't know or things you never understood about him. It may even change your opinion of him after reading the Covenant Series. But this story is also a multiple POV-story! Hear me scream?! I'm such a sucker for multiple POV stories, I don't know what it is. I just like being in both main characters head because I think it gives more to the story than when you just have one perspective. The other POV was Josie. Josie feels like a dork magnet. She isn't all too confident about herself, physically but also mentally. Her mother is diagnosed with a disease and she's really suffering under it. Josie wants to understand her mother and how her brain functions that's why she's studying psychology. Her mother has relapses and you can really see how hard that is for Josie. I loved to see how she reacted and how she felt. And I also thought her reactions were really realistic which made things even more intriguing to me. As the synopsis says, she gets thrown into a whole new world based on ancient myths. I was really curious to how she was going to deal with it. She didn't have the most easiest childhood and I wondered if that would give her a wider perspective on this all or the contrary. But because of her insecurities and her difficult childhood, we also see her struggling in her journey. We see another side of her, the one that wants to achieve and that was really nice to see. Seth and Josie aren't that different from each other which was even better for me! I've had so many pleasant parts in this book where I could laugh and others where I could feel with both characters. Since they aren't that different from each other and show a lot of similarities there's a lot of understanding coming from both of them. And because of that you can see a bond growing, even though both don't want to give into it. Which leads to even more pleasant parts! I like reading about ancient myths and those really contributed to the plot. As usual Jennifer L. Armentrout gave you a story that never gets boring and is really varied. To be honest, I didn't want to put this book down. 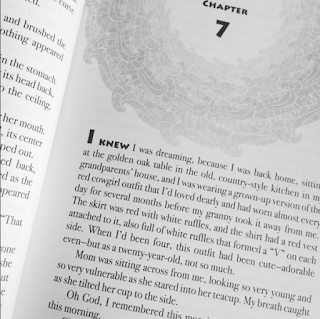 Also at the beginning of every chapter there's this design at the top of the page, and I was kind of enchanted by that! I was very happy in seeing both main characters develop together with the plot. They kind of made it happen and made the plot change. There are so many unpredictable moments which really made it an even better read. There's just something about these two characters that made this book very good! I even think this was better than the Covenant series but that's personal preference. Seth reminds me a lot of Daemon from the Lux series and Josie reminds me a lot of Katie. Though the end battle was the best I've read in this entire book! Not that I didn't enjoy the rest of the book, the end battle was just... SPECTACULAR. I never expected it to go down this way. It was thrilling as well as scary and it really made my active. 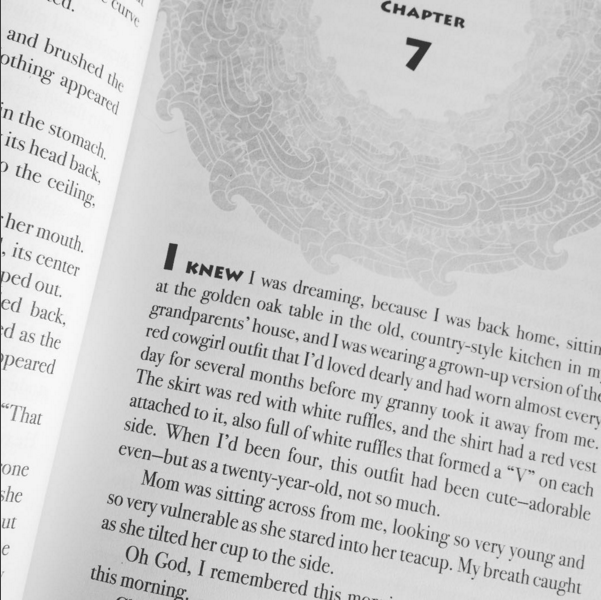 That's really weird though, I was so hyper because of the ending, I kept turning those pages. I felt everything Seth felt, as well as what Josie was feeling. I. Love. Seth. There! I said it! I'm really happy that I read this book and that we could crawl into his head because it's absolutely worth it. We get to know so much about him and see so many other sides to him that I really enjoyed this book. But I do have a remark! As I said, I was very keen on the multiple POV part but it was so confusing at times! The author doesn't announce when we get into the head of Seth or of Josie. So you start reading and may think it's Seth while later on it gets clear that it's actually Josie. I think that was kind of sad because it confused me and made it difficult. Especially if only a few pages later it turns out, you're reading it with the wrong voice in your head. So that was a little disappointing but I still enjoyed reading it. God, it was so good! So, if you're looking for a fierce read with our bad boy Seth and his new task Josie? Read it! It might really give you another perspective towards Seth. It's also a different from the Covenant Series and in my point of view, more thrilling and rough. I really could connect with Josie the most and was really happy to get to know the real Seth. Just please, read the Covenant Series first because I think that might give you an even better feeling towards this book because you understand everything immediately. I had to search a little in the dark like Josie. But that was nice too! I was as blind as Josie was in this new world of Gods and Apollyons. This story will not left you untouched. That said, I can't wait for the second book in this series: The Power! I'm so curious to what's going to happen now and what this all means. The end really makes you want more! "The Fates are cackling their bony asses off... because history has once again been flipped to repeat."